Gift cards are the most popular and most requested item this holiday season; with 57% of adults saying they prefer to receive gift cards this year, according to the National Retail Federation. And for those who give and receive, there are many reasons to rejoice. New laws have extended redemption periods and required issuers to make rules and fees more clear. Still, with so many options out there, there are things savvy shoppers should be aware of. New rules governing gift cards were part of the Credit Card Accountability Responsibility and Disclosure Act passed earlier this year, designed to deliver more transparency regarding expiration dates, fees and other restrictions. So if you've heard horror stories about gift cards expiring before they can be redeemed, or users been charged fees that eat away at the balance, breathe easy. The new laws state cards must remain valid for five years after the date of issue, and issuers can't charge inactivity fees until after 12 months without using the card. Closed loop cards, or those issued by a specific store or brand. These cards are redeemable only at the named store or company, like Best Buy, Target, or Apple's iTunes. Network cards like those issued by Visa or American Express. These cards are good anywhere that brand is accepted. Network cards typically charge fees, that's how the banks make money, but thanks to the Credit Card Accountability Act, these fees must be clearly communicated on the card itself. Even with a law eliminating the "gotchas" in gift card giving, there are a few things to beware of. New legislation passed in July 2010 that postponed the effective date for card disclosure to January 31, 2011, and if a card was produced before April 2010, it can be sold without the printed information, explained Leslie McFadden, senior reporter and credit card columnist at Bankrate.com. So when shopping, you'll likely see a mix of old and new cards. Bankrate studied 54 cards, included 46 from some of the largest restaurant and retail chains and concluded that most carry no expiration date and few fees. A handy list, breaks down the benefits of each card surveyed, and while Bankrate doesn't rank the cards or make recommendations, WalletPop noted a few trends and standouts. Many store-specific cards offer the most ways to redeem. 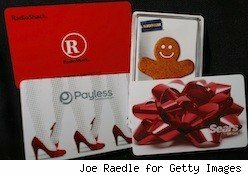 Look for "e-card" options like those on gift cards from JCPenney, Kohl's, Target and Walmart. Many are reloadable, so recipients can combine multiple cards onto one or add to a dwindling balance. We particularly like those cards that let you check the balance online; knowing how much you have to spend before getting to the checkout is a relief. Only one card in the survey -- the KeyBank MasterCard -- requires a PIN number to use, but many have security codes on the back necessary to use both in-store and online. If you're giving gift cards this holiday season, Bankrate's McFadden recommends including the original receipt with the card. That way, even if they lose the card, it can be replaced using information on the receipt. McFadden also advices gift card givers to look closely at the card and packaging, to see if it's compliant with the new law. "You don't want to wind up buying a card that isn't compliant to the new rules, be on the lookout," she said. "And if you're a person getting a gift card spend it right away and try to spend the full value all at once." Otherwise, you just might lose the card or squander some of its value.